The Mubaan hosted today an incredibly fruitful Local to Global leaders dialogue. There is a need to build a collective ‘humans and nature' future. There is a shift of paradigm towards mainstreaming the concept that conservation is about sustainable development. Differences exist in rapidity of this shift between different sectors. Particularly in the governmental sector it is happening slowly. Some of the challenges of fostering this paradigm shift (in mind-set) within organizations include, among other factors, convincing colleagues that biodiversity is not just about wildlife conservation but also about sustainability, development, empowerment, collaboration, etc. The challenge of dialoguing with the corporate sector involves identifying perspective on ‘conservation'. There is a need for more dialogue amongst stakeholders in such forums - emphasizing importance of local-level, ‘Grassroots' and ‘On the ground' approaches and perspectives. There is a need to work through indigenous community networks to identify community expectations with respect to conservation goals. Land tenure and security remain a key challenge - importance of promoting rights to land / resources. Putting these recommendations into practice is much more difficult than it is to talk about them. Hence the need for collaboration with local conservation leaders. There is a need to respect and appropriately take traditional knowledge into account. How are the large conservation organizations working with indigenous peoples on addressing these issues - are common platforms being created? There is a need to strengthen linkages / alliances between conservationists, indigenous communities etc, particularly with respect to knowledge / information sharing, consultation etc. There is a need for large conservation organizations to support Indigenous People's Resolution on building on outcomes from The World Park's Congress in Durban and the CBD COP7. 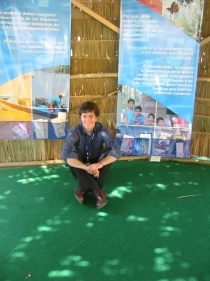 How can communities get value from conservation projects? There is a need for indigenous people to use and capitalise upon the mechanisms adopted by international conventions (i.e submitting resolutions etc), as a key process for expressing concerns to global community. Conservation and indigenous communities should be each others' best allies, identifying and moving forward on common ground. How can we jointly influence and shape agendas of other key actors having a major impact on the environment (e.g. government and business)? Engagement with such stakeholders does not imply that their agenda is being supported but provides the opportunity to engage with them as major actors, in order to promote change in the way they do business. These spaces would also allow creation of opportunities for further dialogues. Collaboration requires dealing with each other as equals. Science and technology - should be seen as an ally and not as an enemy. The question to be explored should be how to further capitalize upon potential benefits of such technologies and capacities, and on the resources of larger conservation organizations. There is a need to translate resolutions and recommendations into action (e.g.IUCNs' indigenous peoples' working group of lawyers working on ensuring customary laws and rights adequately reflected). 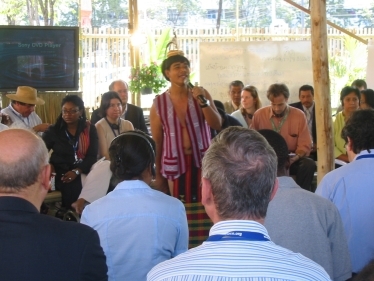 Networking and outreach activities amongst local indigenous groups (Indonesian eg. cited) require further support. Ground level dialogue is a key success factor for effective, meaningful collaborative decision making and action. There is a need for concrete action to build the structures and processes to bring together large conservation organizations and local communities. Afterwards, Conservation International, one of UNDP's Equator Initiative partners, hosted a reception with the inspiring theme of "Cultural Linkages to the Environment and Sustainable Development". This cultural evening focused on indigenous peoples and featured Thai and African dance and theater performances. Dance for the Earth, a new initiative that seeks to link dance and artistic expression to conservation issues, was part of this incredible cultural exchange.